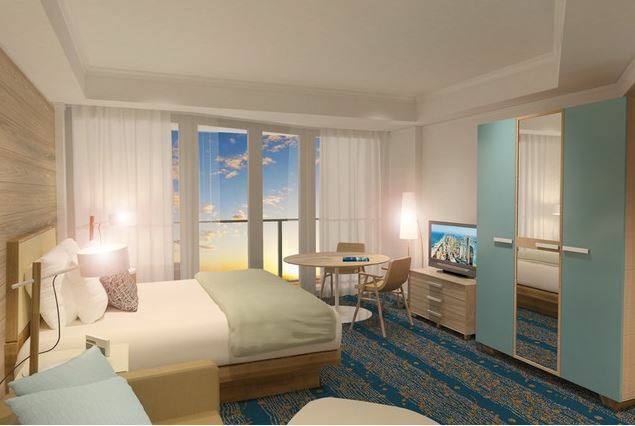 A new luxury resort has hit Surfers Paradise on the Gold Coast that has a familiar feel, but is brand new – welcome Marriott Vacation Club at Surfers Paradise! The latest addition to the GC is comprised of expansive deluxe suites that families and couples alike will absolutely love! And the best part about this resort? It resides inside the renowned and award-winning Marriott Surfers Paradise. 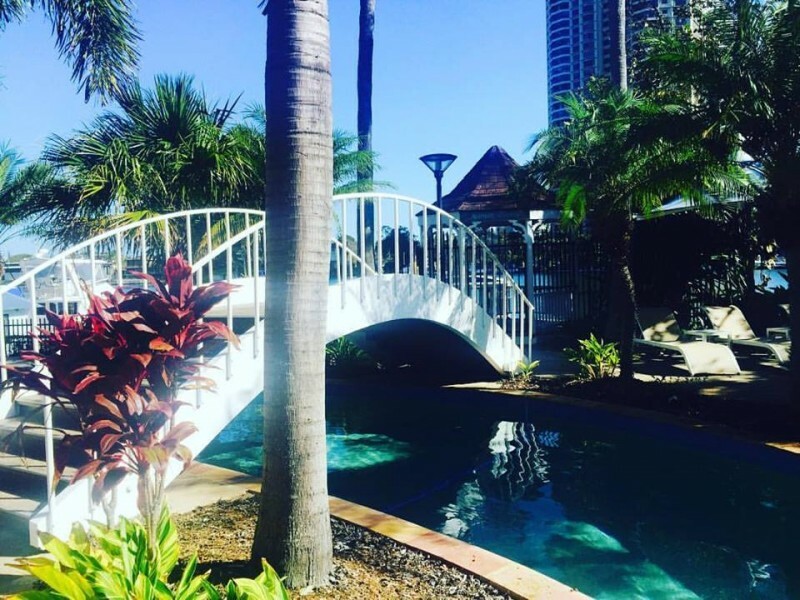 This pairing of resorts gives guests access to all the amazing facilities of the iconic Marriott Surfers Paradise while also offering special touches unique to Marriott Vacation Club. This includes thorough remodelling of all 88 rooms, including deluxe guest rooms and deluxe one bedroom suites accommodating up to 5 guests. Guests will love their own private balcony with breathtaking views over the iconic golden sand beaches, impressive surf breaks, beautiful city, and finally the luscious rainforests and dominant mountain ranges – the views are truly like no other. Looking back inside the suites you can expect modern features, impeccable decorating, as well as the 5 star touches you’d expect from the Marriott Vacation Club including complimentary high speed WiFi, flat-screen TV’s, daily housekeeping service, and famously comfortable beds. Each room also features a kitchenette giving you the option to have some meals in the comfort of your deluxe suite enjoying the amazing views. 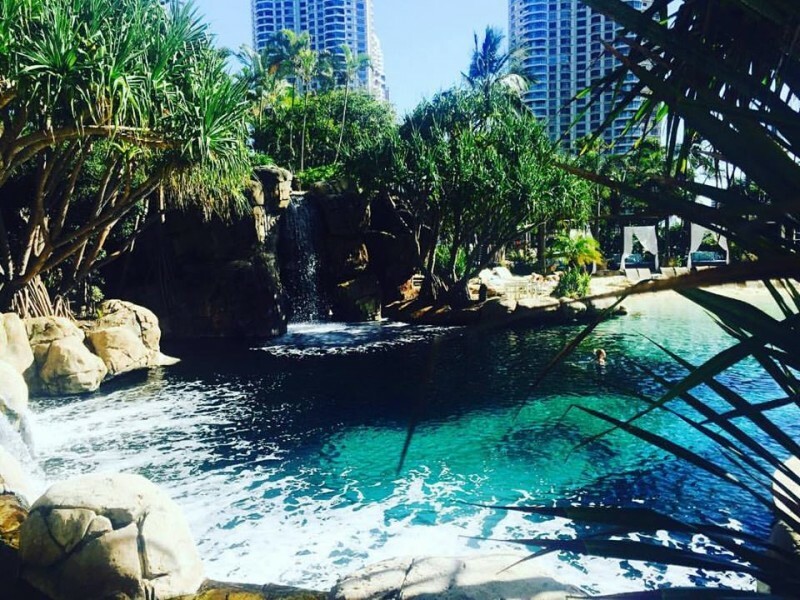 One of the reasons the Marriott Vacation Club at Surfers Paradise has launched into the holiday market with high demand are the fantastic facilities on offer to all guests. When staying with the Marriott Vacation Club you have access to all the same facilities as guests of the Marriott Surfers Paradise from pools to restaurants to the day spa and gym. We highly recommend your first stop be the spectacular pool area. This $8 Million aquatic playground presents itself proudly as the centrepiece of the resort featuring an enormous salt water lagoon pool that comes with not one, but two white sand beaches adorned with sun lounges to enjoy the 300 days a year of perfect sunshine. For an even more luxurious experience you can hire one of the spacious cabanas that lie around the lagoon for a half or full day giving couples and families a private place to retreat during a day by the water. The basic package is approximately $90 and comes with two cocktails and bottle of water; however, in true Marriott style you can also have champagne and seafood delivered to you if it tickles your fancy! Another special touch the lagoon delivers is the tropical fish that call it home! You can get up close and personal with them either in the water with a snorkel or from the walkway, with the best time to see them being at 9.30am during feeding time. Did we mention the waterfall? And you don’t need to go chasing it ;) As well as being beautiful, it plays a mesmerizing sound track of tranquillity and is great fun to swim underneath! For those who don’t like to share the water with sea life, you can enjoy the expansive fresh water pool! This awesome section of the aquatic area comes complete with sun lounges, spa, and even a whirl pool! You can hire noodles for the kids to enjoy or bring your own inflatable rings for them to float around on. 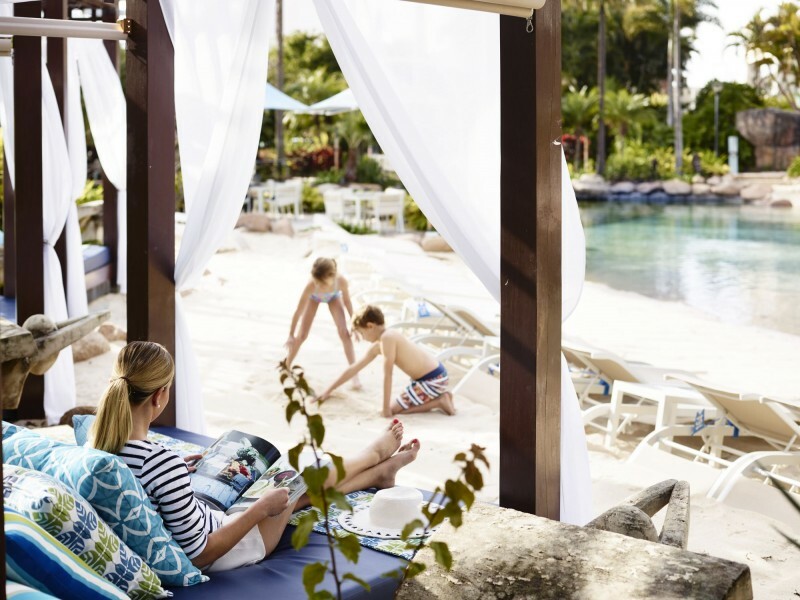 The kids will also love the rock grotto cave systems that link the salt water lagoon to the fresh water pool, they’re a fun and safe place for them to explore and they lead up to the winding water slide! Over the bridge beside the fresh water pool there is an exit from the resort that leads out to the waterway hugging the resort – from here you can hire a boat, fishing rods, and picnic packs to head out and enjoy a spot of fishing or plain old exploring! The best part is you don’t need your boat license to enjoy this little extra. After a day on the water you are sure to have worked up an appetite, in which case you can hit up one of the five dining options the resort boasts. The pool bar is front and centre offering light meals, snacks, and of course cocktails, while Chapter & Verse Lounge Bar delights guests with views of the beautiful lagoon paired with light meals, cocktails, and nibbles. They even cater to the little ones by making special meals to order for them so you can enjoy the atmosphere as a family. Finally there is Misono Sake Bar, Misono Japanese Steakhouse, and Citrique. Both Misono and Citrique are award winning restaurants famous for their fresh and delicious meals and fantastic service. 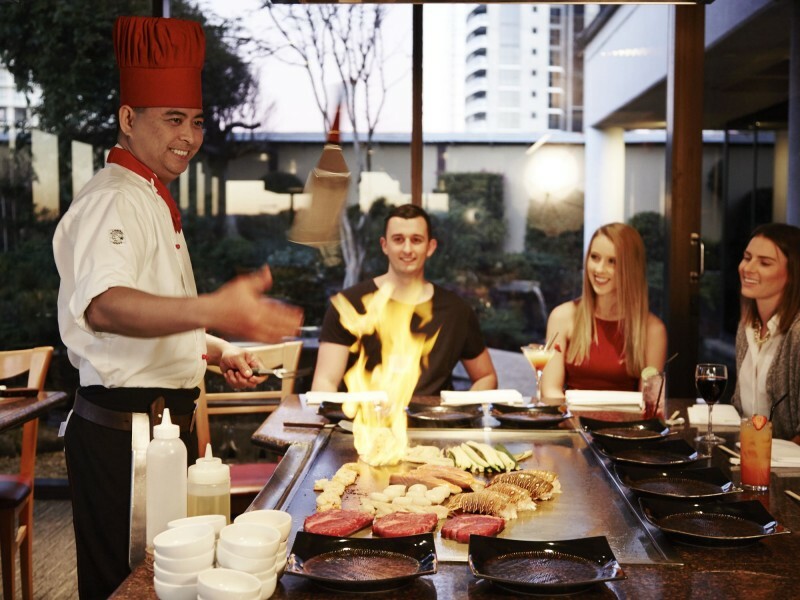 Citrique offers the best seafood on the Gold Coast, while Misono Japanese Steakhouse boasts famous teppanyaki with personable chefs preparing your meals right in front of you. It’s dinner and a show at Misono. Other fantastic facilities at the Marriott include the fitness centre, a fully equipped gym open 24/7, and Ruby Day Spa offering a lavish array of rejuvenating treatments from massage to facials to hair treatments and cuts for both men and women – there is even a separate barber room to make the men feel at home!